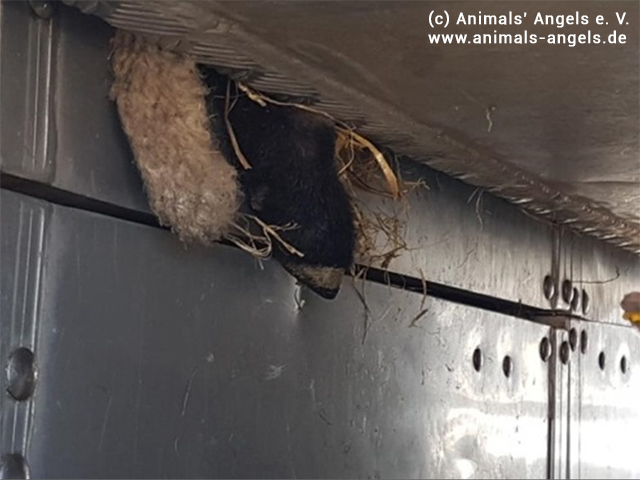 26-03-2018 Animal Transports EU Created by Animals' Angels e. V.
At a motorway service area in Slovenia, we spot an animal transport with Hungarian lambs. The truck parks only for a short moment. We see that the leg of a lamb is trapped between the floor of the second loading level and the tailgate. We try to let the drivers know, but they (supposedly) don't see us and just drive off. Since they don't stop at the next two petrol stations, we call the Italian police after crossing the border. The drivers are asked to free the lamb which succeeds. The animal seems unharmed. The police impose a fine of 1.333 € Euro, because the 720 lambs are transported on four levels and above all the lowest level is so low that some of the animals cannot stand upright without bumping their heads against the ceiling. The water supply only works on the lowest floor. The police order the water to be used on the other floors as well.